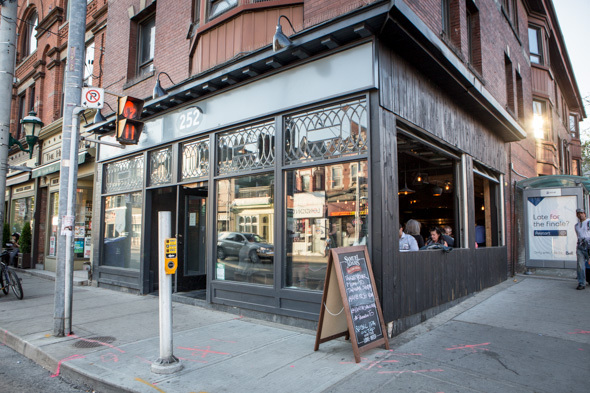 Kanpai is a Taiwanese snack bar that's introducing Cabbagetown to a taste of Taipei that goes above and beyond bubble tea. At dinner hour on a weekday every table in the wood-clad dining room is occupied. It's a casual setting that attracts families early on while the younger set take advantage of the late night kitchen and unique bar program. Tap cocktails like batch-made Negronis and Manhattans are the main draw, while you'll also find Vineland wines ($1.50/oz, Izumi sake ($9-$11), craft beers ($7/16oz), and eventually cold brewed coffee all on draught as well. 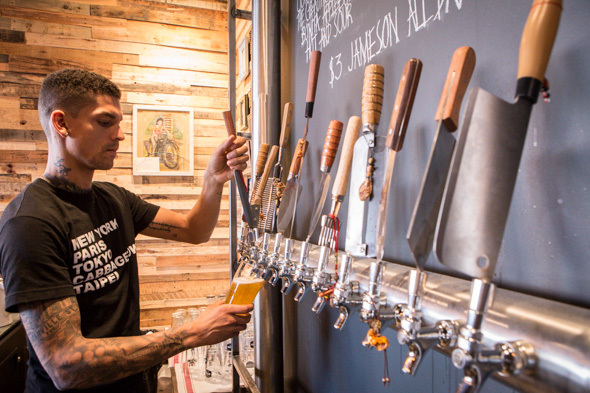 Dustin Keating of Montauk has designed a list of hand-crafted libations too. 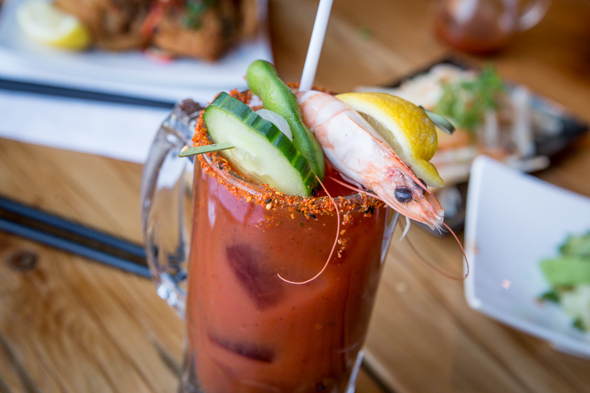 There's Chang Kai's Caesar ($10) made with a choice of booze (gin, vodka, sake, or tequila) and seasoned with sambal, fish sauce, Worcestershire sauce and a togarashi schimimi rim. The menu amounts to a collection of small plates primarily priced between $4 and $8 that are influenced by Japanese, Korean, Dutch, and even Hakka cuisines. Taiwanese antipasto ($5) is one example, comparable to banchan (only not free). The trio of pickles will change seasonally, but today it's tangy cucumbers, daikon and kimchi. 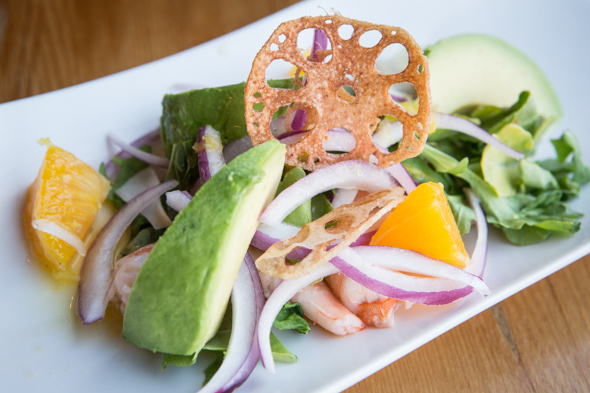 Shrimp Po Po ($6), a cold salad featuring prawns paired with tart pomelo supremes and avocado in a "spicy" tamarind dressing, lacks any detectable of spiciness, but it is indeed refreshing. 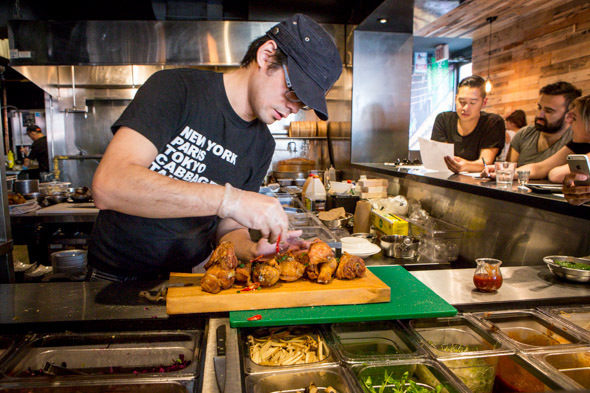 The most substantial thing you can order is the Taiwanese fried chicken, a.k.a, TFC. 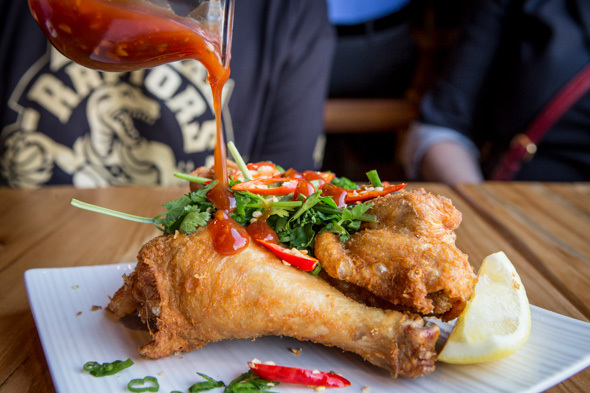 The crispy skinned poultry is deliciously moist and can be had by the bucket ($19) or as a three piece order ($8). It comes topped with chili peppers, cilantro, and scallions alongside a little pot of sweet chili-spiked sauce. 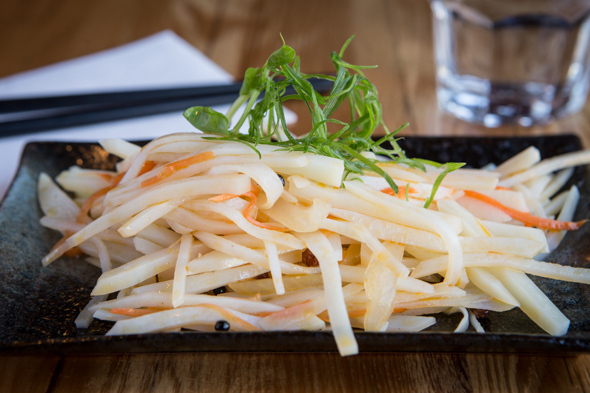 On the side, Taipei tater slaw ($5) is made with waxy spuds, cooked to al dente then julienned and dressed in Szechuan peppercorn dressing. It's a simple but delightful dish. Flavour-wise this dish exceeds the sum of its parts, and as I eat I find myself asking aloud, "why is this so good?" in between bites. 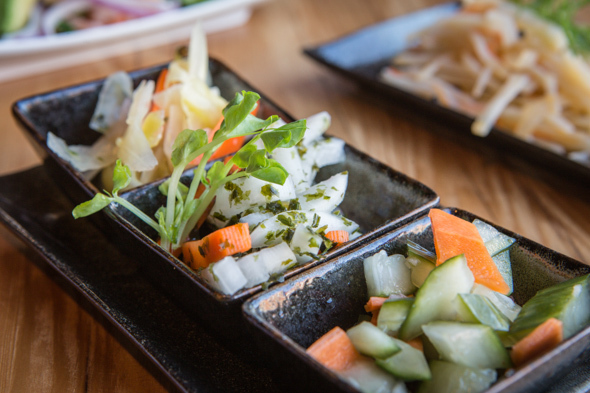 The kitchen at Kanpai is open from lunch until at least midnight (later still on weekends). Gluten-sensitive eaters should add this one to the list, as the menu lists a multitude of dishes that can accommodate such a diet.